Hi! I'm Iain. I'm a scientist, and I'm interested in using tools from maths and physics to describe, analyse and predict things about the complex world we live in -- my research webpage is here. This page is a loose and incomplete collection of some areas of interest, recreation research projects, and hobbies of mine. Most fall into either scientific, mathematical or computer programming categories, but the lack of a justifiable umbrella to amalgamate them all in part motivated the name of this page! I hope some of the projects and/or links here are of interest. Please note that everything on this site falls firmly into the category of "toy science" and the projects herein are small, informal investigations rather than anything I claim to be rigorous or valuable. Named for the excellent book on fractals by Field and Golubitsky, not the Greek black metal band. Chaos is a technical field with a wonderfully attention-grabbing title, compared to "nonlinear dynamics", the name of the discipline that addresses the description of chaotic systems. I think "physics" -- which provokes images of dry school mathematics, uninspiring circuitry and projectiles -- should be awarded a more adventurous name. "World modelling" would be an example -- physics possesses the language to describe the behaviour of systems from crowds of people to waterfalls and from the building blocks of the world to the place it sits in our Universe. Among the other fascinating books that describe the applications of physics and maths to the beautiful and complex world around us: The Fractal Geometry of Nature; Chaos; Godel Escher Bach; Critical Mass; Games of Life and Complexity: A Guided Tour are all highly recommended. Snowflakes are a striking example of pattern formation in nature. Most snowflakes in the UK aren't particularly impressive: it rarely gets cold and dry enough to produce symmetric crystals, so we see lumpy, amorphous snow falling. In more extreme climates, incredibly intricate and symmetric crystals have been found. How does this intricacy arise? When growing from the centre out, how does one arm "know" what patterns the other arms are forming? The best explanation so far is that snowflakes grow in very homogeneous conditions -- there are no asymmetric influences that would force one part of the crystal to behave differently from another. However, given that snowflakes form in the atmosphere, buffetted by winds and changing temperature and pressure, this explanation seems lacking. 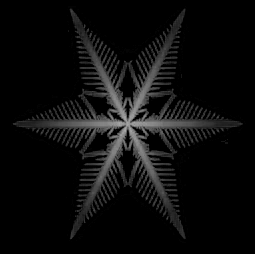 Computer models exist for snowflake assembly -- here's my video of one of them -- an ongoing project is using these to investigate how snowflakes assemble in the real world. 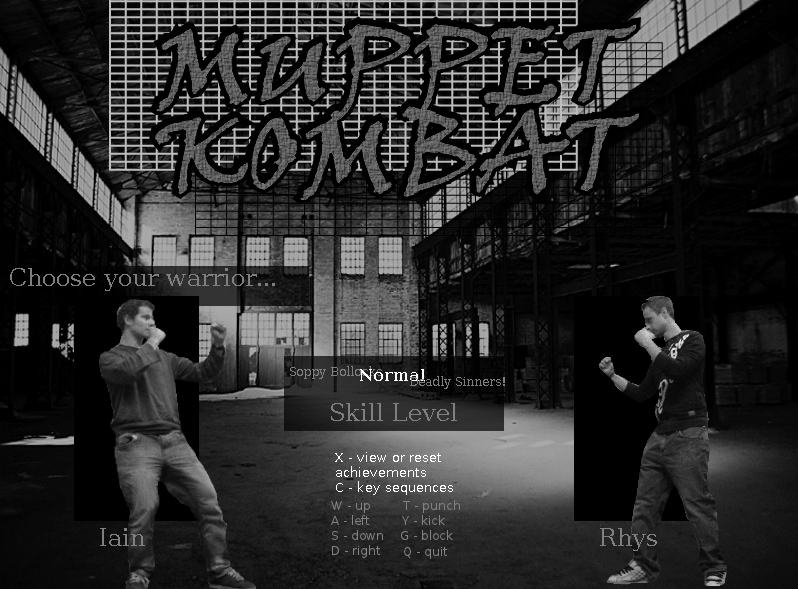 Muppet Kombat is a Java-based beat-em-up in planning since 2001. The latest release can be found here. 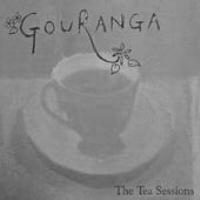 My old band from Cambridge. We played folky jazzy rocky songs -- genre-spanning musical fusion! Some songs are online here. It turns out that, like fractals, heavy metal music in a sense is "scale-free": the hierarchy of musical influences within the subgenre displays similar structure on different levels. A while ago I tried to quantify and illustrate this phenomenon -- see here. Simple (and complex) model plants can be produced using a fractal growth process. Barnsley's fern is a famous example, yielding remarkably lifelike, branching frond structures. A toy project of mine some time ago was to evolve the parameters of a mathematical way of producing fractal plants, so that the parameters (or genomes) of the plants that harvested the most light won out and produced offspring. The resulting experiment combines fractal growth with evolution or a rugged, dynamic landscape. The power spectrum of a signal is a mathematical concept that is, among other things, a way of observing how much "memory" the signal has, expressed here by colours. 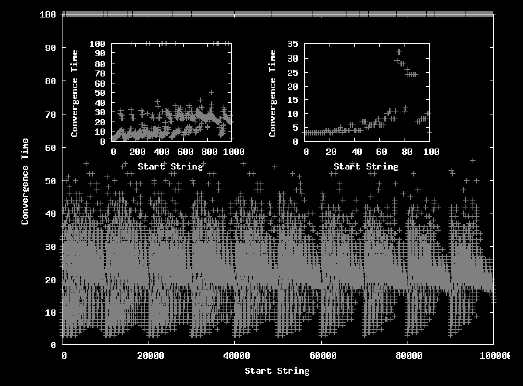 White spectra come from signals with no memory -- the spectrum of a sequence of random die rolls would look white, as the next roll doesn't depend at all on the previous one. Red spectra come from signals with strong memory -- the spectrum of a person's trajectory over the course of a day on a map would look red, as where the person can be in one minute depends strongly on where they were the previous minute. Pink spectra come from signals with an intermediate amount of memory and are a source of considerable scientific interest -- see here and the studies cited within. Music can be artifically made to conform to a certain colour spectrum. A study asked listeners to rate white, pink and red music and judge how pleasing they sounded. White was deemed "too random" and red "too boring". The intermediate case, pink-spectrum music, was found to be the most pleasing. An ongoing project of mine is to find reasons why, and examples where, this intermediate dynamic regime is in some sense optimal. Here is a word game. You have a 5x5 grid. Place the letters a-z in the grid to get the maximum score. Your score is the combined length of all unique words you can spell by traversing the grid in a horizontal or vertical line. Which contains the words: RE, TAR, ARE, STAR, TARE, STARE, PI, IT, TI, IS, PIT, TIS, AN, NO, NOD, ODE, NODE, ANODE, EN, NEW, RENEW, HE, EM, ME, THE, HEM, THEM, HEME, THEME, PA, SPA, PAR, ART, SPAR, PART, IN, EH, TIN, TINE, AT, TO, ON, TON, ONE, TONE, ATONE, ID, RID, RIDE, IDEM, WE, SEW, EWE. I believe I used this dictionary. Related to the above, I have also written a crude solver for the 5x5 'Boggle' game, where one tries to make as many words with >3 letters as possible from a 5x5 grid by moving to nearest neighbours and not reusing letters. An outrageously high score is possible with the input R S C L S D E I A E G N T R P I A E S O L M I D C (suggested here). Mandlebrot's classic book describes how, in describing a wealth of natural phenomena, fractal geometry is a more natural language to use than the systems of straight lines, planes and polygons that highschool physics presents us with. As an example, the fractal structure of the drainage basins of rivers is exemplified by some wonderful shots from Google Maps like those here and here. It is straightforward to make an artificial drainage basin. My informal approach runs as follows. Starting with a flat "island", randomly choose spots where drops of rain fall. A drop always rolls down the steepest slope in its vicinity, or in a random direction if it's on a flat surface. When it moves, it erodes and moves some of the island with it, lowering the island surface at the point it moves from. After many simulated rainfalls a fractal drainage basin structure emerges -- see, for example, here. 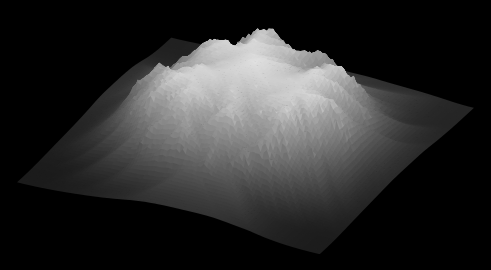 I wrote a toy Java program to simulate this process on some islands (with vegetation and surface water too) -- download it here. An old playground game, where the letter counts of two names yield a numerical sequence, displays some interesting behaviour and fails to terminate for some classes of names. My light-hearted analysis of the structure of this game is here. 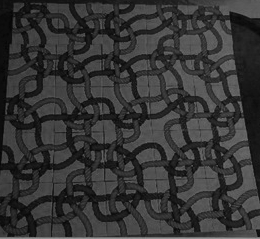 Rubik's Tangle is a combinatoric puzzle where one must place a set of 25 tiles in a square so that each picture of a different coloured string forms an unbroken path through the square. Like many small-scale optimisation problems, it may be solved through simple heuristic optimisation techniques. I used a Metropolis Monte Carlo process, where tiles are swapped and rotated randomly and an "energy" defined by the number of matched edges is minimised thermodynamically. Back-of-the-envelope calculations and estimates are very useful in the sciences. However, if they involve quantities which are uncertain, they rarely track the potential errors in the calculation. We made a calculator that can deal with uncertain as well as certain quantities -- doing maths with probability distributions! Check it out and use it to perform estimates and calculations with noisy and random quantities here!